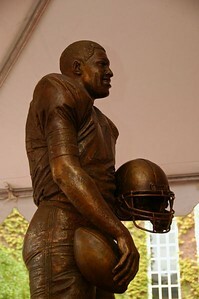 Statue tribute to Ernie Davis was unveiled on the Syracuse University campus on Saturday, September 13, 2008. I attended the Penn State/Syracuse University football game last Saturday. Got up to the SU Quad early to watch the unveiling of the statue to honor the memory of the great Ernie Davis, the first African-American college player to win the Heisman Trophy as college football’s best player in 1961. Syracuse University’s Chancellor, Nancy Cantor, announced a new student dorm will be called Ernie Davis Hall and have a state-of-the-art recreation center for all students to enjoy. Another honor to Ernie Davis will be released by Universal Studios in the United States on October 10, 2008, in a movie depicting Ernie Davis’ life called The Express. Other past famous SU players who wore the Number 44 jersey, Jim Brown and Floyd Little, were in Syracuse where the movie premiered last Friday night along with actors, Rob Brown (who played the adult Ernie Davis) and Dennis Quaid (who played SU coach Ben Schwartzwalder). Below are some more images I photographed during the cermony. 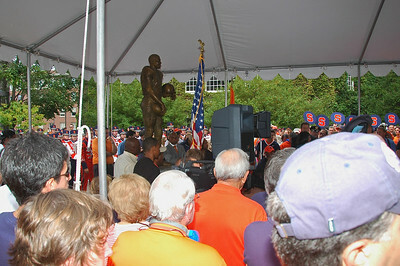 The Ernie Davis statue just seconds after it's unveiling. 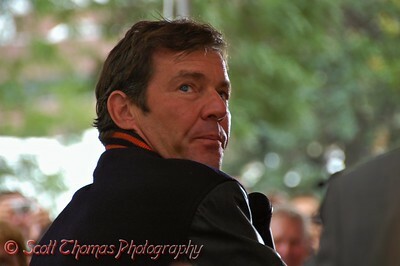 Dennis Quaid, who plays Coach Ben Schwartzwalder in the movie, The Express, looks back at the Ernie Davis statue while addressing the audience. 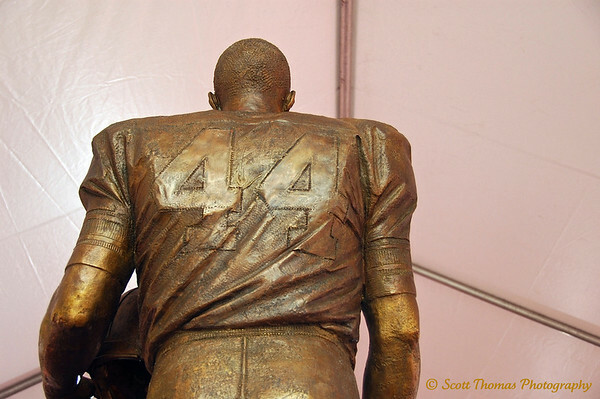 Closeup of the Ernie Davis statue by Bruno Lucchesi. If you have the chance to be up to the Syracuse University campus, the Ernie Davis statue is next to the walkway between The Quad and the Carrier Dome. This entry was posted in People, Sports, Weekly View and tagged black history, ernie davis, football, heisman trophy, Photography, statue, syracuse university. Bookmark the permalink. Great shots as always. Good to see you’ve kept the momentum going – I’m picking up blogging again after a busy summer. Thanks, it’s fun to look around my area and see what would be fun to photograph. I saw a preview for this movie a few days ago! Not a football fan, though, so I doubt I will watch it…. unless hubby adds it to netflix.